Anthony Sylvester grew up on the east side of the Big Island and graduated from Waiakea High School in 2008. 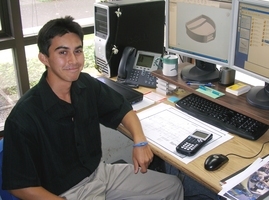 He is currently a Junior attending the University of Hawaii at Manoa, pursuing a Bachelor’s degree in Mechanical Engineering. After obtaining his Bachelor’s, he hopes to continue on toward a Master’s degree. In his free time he enjoys participating in numerous hobbies which include hiking, hunting, skimboarding, skateboarding, camping, fishing, and building things. Ethernet for Control and Automation Technologies (EtherCAT) is known as a high-performance industrial communication protocol with predictable timing, high data-transfer rates, and precise synchronization. Common uses of EtherCAT are in industrial automation and motion control operations. The unique design of EtherCAT allows it to function over standard Ethernet cabling, and it is offered by an increasing number of manufacturers, thus making it an economical option. The main purpose of this project was to determine the operational characteristics of an EtherCAT system, and its applicability toward the controls subsystem of a land based astronomical telescope. Secondary objectives were to determine the compatibility between hardware and software components from various EtherCAT hardware manufacturers, such as National Instruments (NI) and Beckhoff Automation, while operating over the EtherCAT protocol. Throughout this project, numerous experiments were performed to analyze the timing and data transfer properties of an exploratory EtherCAT system. The most critical aspects tested were the simultaneity, jitter, latency, and throughput. These were the determining factors of whether this technology could be adapted to the Thirty Meter Telescope (TMT) Project. A series of different hardware configurations were tested with varying results. It was determined that some hardware configurations operating over EtherCAT are adequate for use at TMT, while others are not. A report was then generated which included a comprehensive description of the experiments conducted, and an advisory of recommended EtherCAT implementations. This report will be made available for use by the TMT design staff.